On Thursday morning I drove east on the 10 past the stretch of Los Angeles suburban sprawl until the malls faded into gas stations and the houses thinned to shacks and sheds. 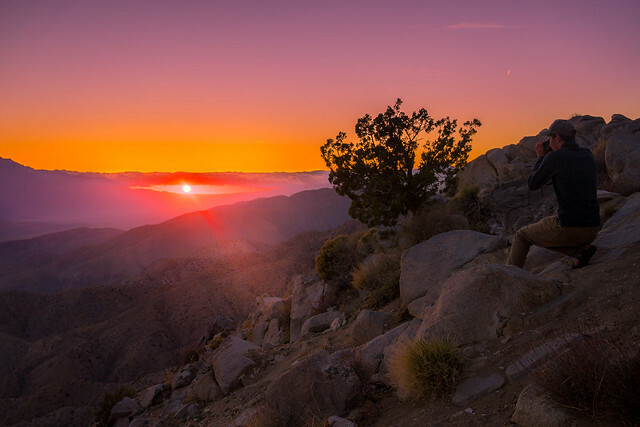 Once in the open desert on the other side of Riverside county I realized I forgot the annual national parks pass we’d purchased in sequoia last spring. A warning, perhaps? When civilization whittled to nothing and the last turbine faded from view, an oasis appeared on the horizon. At least that’s what the sign said. 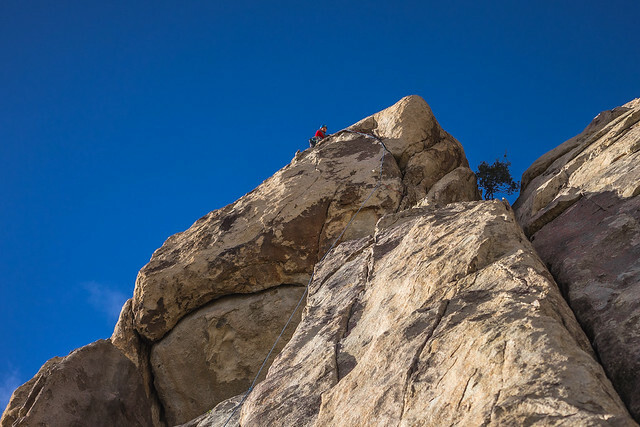 29 Palms is a one stop light town with a national park entrance appended perpendicularly to the main drag. I guess since there’s water and it’s in the desert that makes it an oasis. Expectations began to dim for the rest of the weekend. Inside the park I went straight to Ryan Mountain, the tallest hike. My reasoning, honed with practice at several other national parks,went like this: My knees are getting older and I didn’t bring braces or pain killers, so I should take on the most strenuous work while my legs are still fresh. Turns out strenuous work wasn’t to be had on Ryan Mountain. It only took an hour to reach the peak, and I guess you get what you pay for because the view was, well, open desert in every direction spotted by boulders. Not ugly per se, but nothing to sneeze at if you’ve hiked up to a glacial lake in Montana, a frozen waterfall in Alberta, an ice cave in Iceland, paraglided over sheer cliffs in Switzerland. You get the idea. A collection of loose and clumped dust in every direction isn’t what soothes my soul. But that’s my preexisting bias talking having been born in a forested place rich with water and leaves and life (and polution and chemicals and death, too, unfortunately). Honestly, the desert can be a damn depressing place and since Sam didn’t have any vacation time and my friends flaked…I was not developing a strong love for Joshua Tree’s hiking opportunities that first day. 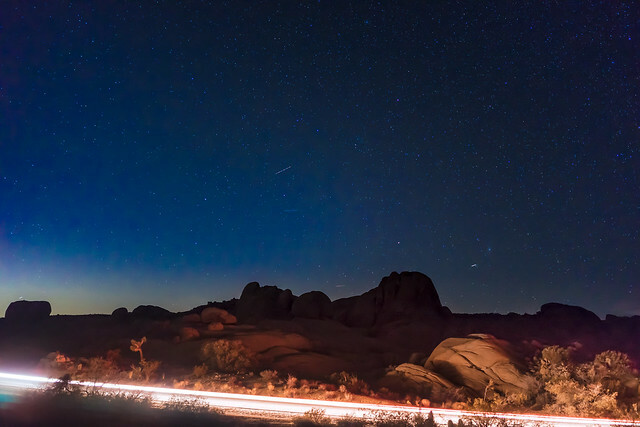 But I didn’t come to Joshua Tree for the hiking, I came for the stars. All this hiking and walking was just to kill time until sunset. And calories; I asked for a side of onion rings with my burger at lunch in NowheresVille and they brought out a serving tray full of fry batter. I went to Keys View, supposedly the place for sunsets in Joshua Tree. The view features an overlook of Palm Springs and Indo against a backdrop of the mountains. I arrived ninety minutes till sunset and my stomach was growling (remember what I said about burning calories?) so I headed to the town of Joshua Tree for a smoothie. I barely made it back to Keys View in time for the real deal, running up the path and slipping on the rocks on the other side of the fence to capture a triumphant sunset. A thick ceiling of clouds capped the far mountains and caught the setting sun like a great searching eye in the distance. If Tolkien wouldn’t have loved it, I can confirm that at least amateur softcore pornographers do. I went back to the spot every day after only to be disappointed. I drove off in the twilight to Barker Dam, hoping to capture the stars in the water’s reflection. However, after walking down the trail and bouldering around in the pitch black of a new moon for an hour I had to give up. I’d reached the top of a boulder mountain with nothing but sneakers and a wimpy flashlight. Shining it down below the crest revealed a darkness that could be trees or water, but the absence of reflection hinted at the former. Not wanting to get lost in the dark in the part of a park no one would visit for another ten hours I backtracked to the car and spent the next hour driving back through the park to 29 palms, stopping randomly to attempt night shots on the way. On Friday I went first to the chollas garden before heading north to visit arch rock. I’d intended to shoot night photography of the arch the night before, but I couldn’t find it on the map. That’s because it’s located inside the White Tank campground and no signs for the arch appear until you are parking there to take the arch rock trail hike. Wanting to discover where I’d gone wrong with Barkers Dam I headed there next. As it turns out there are two trails that start from that parking lot, spaced about a hundred feet apart. In the dark I only saw the one by my car and went down it, unknowingly heading for the abandoned Wall Street Mine. The bouldering in my attempts to correct the night before actually led me to traipse over an area clearly visible in the morning light to be part of the park closed off to the public (for danger?). And the dark patch I’d seen was, in fact, trees. At Barkers Dam I discovered the wind blows over the water (as it does quite swiftly everywhere in the park), rippling it and making my planned star shots impossible anyway. Other than a few ducks, there wasn’t much of interest at the dam so I walked up to the mine. Also underwhelming to a boy from Ohio/California. But some other hikers there were fascinated by the hundred-year-old strips of steel and rotting wood. Old rusted cogs and pipes and pieces of cars Henry Ford lived to see. Not sure what to do next I turned into a parking lot and wandered into the valley just to the left of Echo Tree Trail. Unsatisfyingly this flat hike ends in a barb wire fence. I walked the nearby hidden loop trail before going back to town for another smoothie. I went back to keys for the sunset but it was pathetic (and much colder!) compared to the night before. 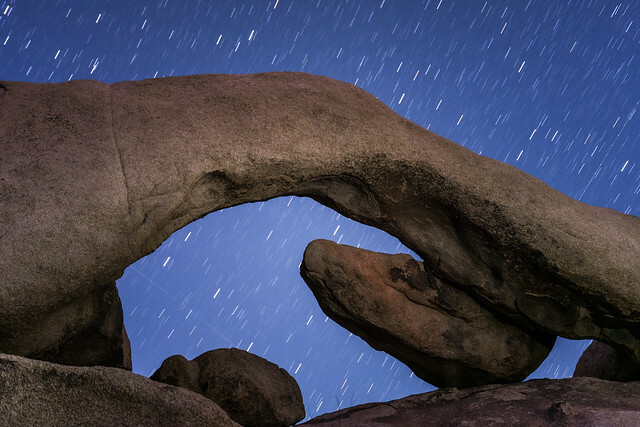 At the arch rock, I tried some night photography but strong winds (I would later read 45 mph!) shook the camera and rattled my frozen bones. Okay, so compared to -30 in Alberta it wasn’t that bad, but there’s nothing worse than waiting on a twenty-minute star trail exposure just to have the wind creep up on you and shake the tripod at the 19’58” mark. In frustration, I collapsed my equipment and headed to the hotel. On Saturday I went to skull rock, a place I’d driven by on my way elsewhere several times at this point, to try the short hike. The hike, it turns out, goes to a parking lot around the side of the rocks and starts over. Just for fun I “lost” myself in the rocks on the way back. Hard to lose one’s self, though, with so many large glaring directional indicators laying about. On my way to Hemingway rocks I stopped several times to photograph what had been mundane the day before. Heavy dark clouds rolled overhead with sun splashes sneaking between. 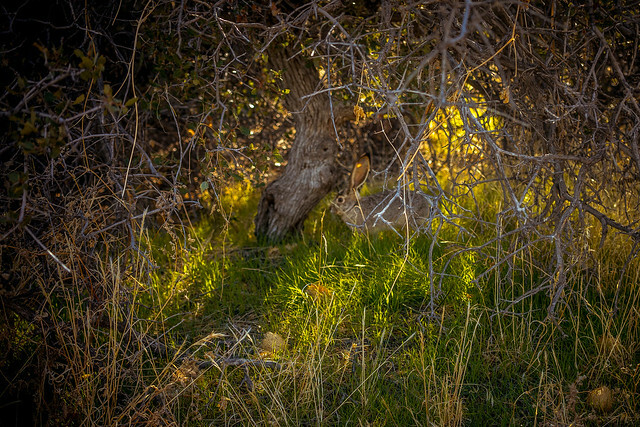 The altered light gave the green of the joshua trees a vibrancy they lack in the full sun washout. Reminded me of a car I once bought in Ohio with a green paint job that shined after the rain, then moved to Southern California where it “never” rains and everyone thought my car was gray. Well, on Saturday morning the Joshua Trees were not gray, but nearly lime green and the thin grass not the dusted ochre of yesterday, but a brilliant sunshine yellow making up for the lack of such color in the sky. At Hemingway I walked out and bouldered up to the rock climbing spot to shoot some climbers on the wall. Afterwards, seeking a challenge for my legs I started walking on a whim down the 7.7 mile (one way) boy scout trail. I intended to just turn around after an hour or so to get in a few good miles before lunch. However, after a mile the trail turned right to go to something called “Wonderland of Rocks” if I promised to walk another two and a half miles. The wonderland is a ever-narrowing trail that eventually surrounds the hiker on all sides with rocks before eventually winnowing down to a marsh pelted with fallen boulders. Those who wish to keep hiking can boulder their way through the narrow crack in the larger rocks, but I turned back, hungry for another smoothie. My legs needed a break (and carbs) so I went to town for pizza (which is pretty good!) 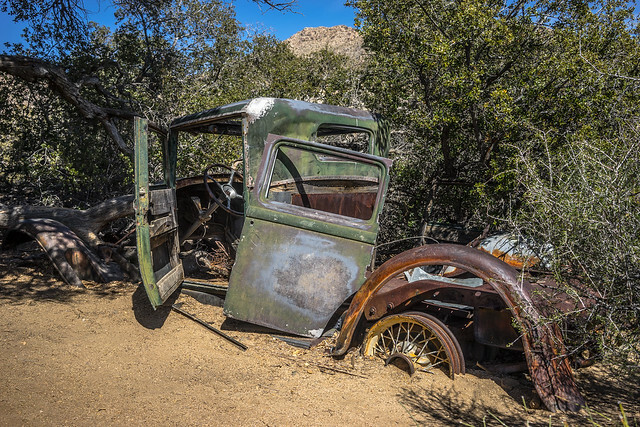 before heading to black rock canyon to the northwest of the park (actually not part of Joshua Tree national park but a day-use area) to make the five-mile west side loop. After the earlier 7-ish mile hike a five-mile trail up the mountain turned out to be a bad idea. My left knee told me so for the entire last two miles. Perhaps to make up for it, mother nature decided to hop a couple of black-tailed jackrabbits close to my walk. Didn’t let them stick around long enough for a great photo, but jackrabbits are skittish by nature, so I was lucky to get within a few feet at all. I tried the sunset at Keys View again, waiting in the buffeting horrendous winds, but the blazing eye still didn’t equal what I saw the first night. 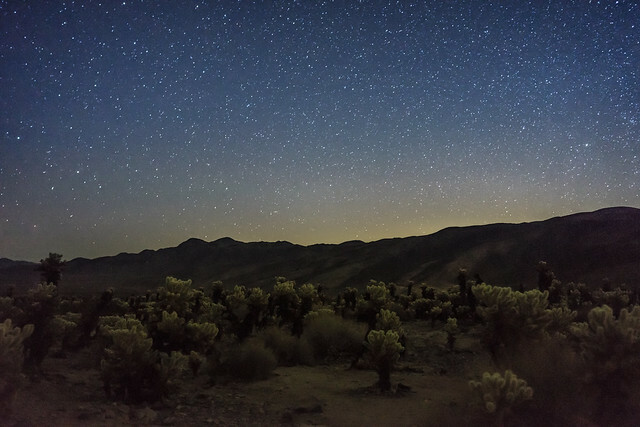 As night fell I drove to the chollas garden to take star shots. 45 mile per hour winds, wandering teenagers on marijuana, cloud cover, and nagging “professionals” with heavy laser star mapping machines making it clear they wanted me out of their neighborhood made the job difficult yet again. When those elements forgot about me occasionally the garden became extra creepy. 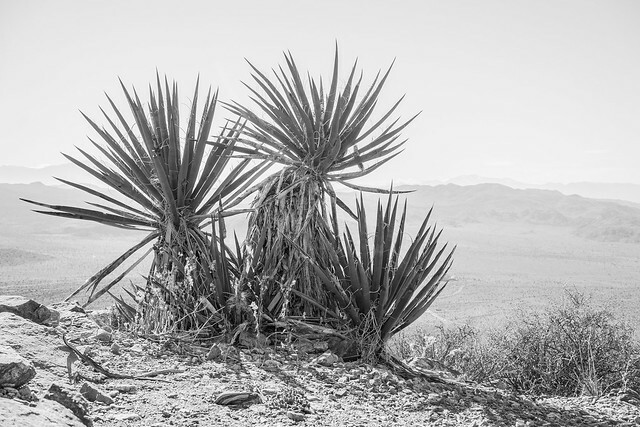 The chollas look like people in the dark and my coat scraping against my backpack in the wind sounded just enough like approaching footsteps to have me whipping around to check my surroundings in illogical fear more times than I’d like to admit. Then again, coyotes do prowl the valley at night. On my last day I visited the Chollas garden again and kept on south, reaching Cottonwood by mid-morning. 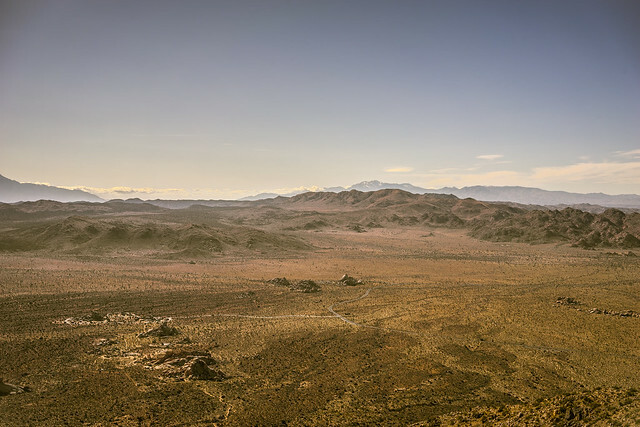 I hiked up to Mastodon Peak, fun for the bouldering and the view of the Salton Sea in the distance, but otherwise a largely unimpressive walk through a stream of loose gravel. 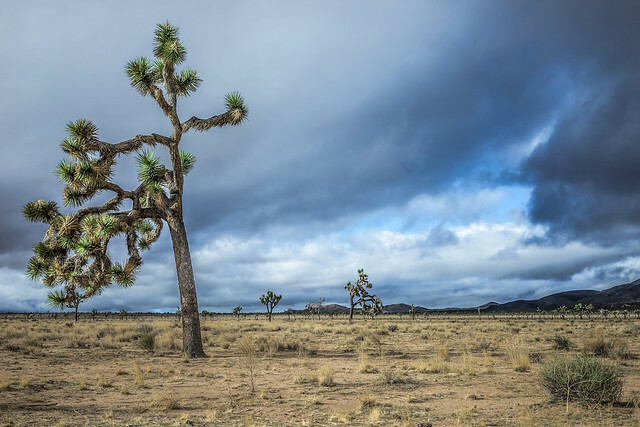 I had one more thing to see before speeding home: a walk “on a real Bajada,” the Joshua Tree brochure proclaimed with such excitement that I assumed miracles awaited. I should have looked up the definition for Bajada. I’ll save you the trouble. It’s a wash of dirt and rocks that come down from a mountain. And up through those rocks, a few desert trees (and dead ones) grew on a short flat trail overlooking the 10 freeway. The most memorable thing I did on that day was eat shrimp tacos in Indo.